I'm on the fence about this skirt. I think my main issue is that I don't know what to wear with it. This top is the only thing in my closet that looked ok with it. Wearing a shirt with a collar seems to counter the primness of the silhouette. I tried on several tops with short sleeves but instantly felt frumpy. Not sure why. Any suggestions on what to wear with a full, midi length skirt like this? I'm thinking I should make a sleeveless collared blouse out of linen to go with it. Maybe white, maybe a purple?? I'm hoping I didn't just make a closet orphan. I'm also contemplating shortening the hem to knee length thinking I'd be more likely to wear it then. I do like that this length is something different in my closet. Anyhoo, on to the pattern details. Pattern Description: I made Butterick 5929 again. You can see my first version (view A) here. This time I made view D, the midi length gored skirt. It is definitely a departure from the type of thing I normally wear. But I've been trying to branch out a little lately. And I'm on a mission to make some warm weather work appropriate things before school starts in August. Pattern Sizing: I made a 16 but took in the waist a 1/2 inch on each side. So could I have made a 14? I don't know. I'd rather go bigger and take in than make something too small. Not much else to fit other than the waist. 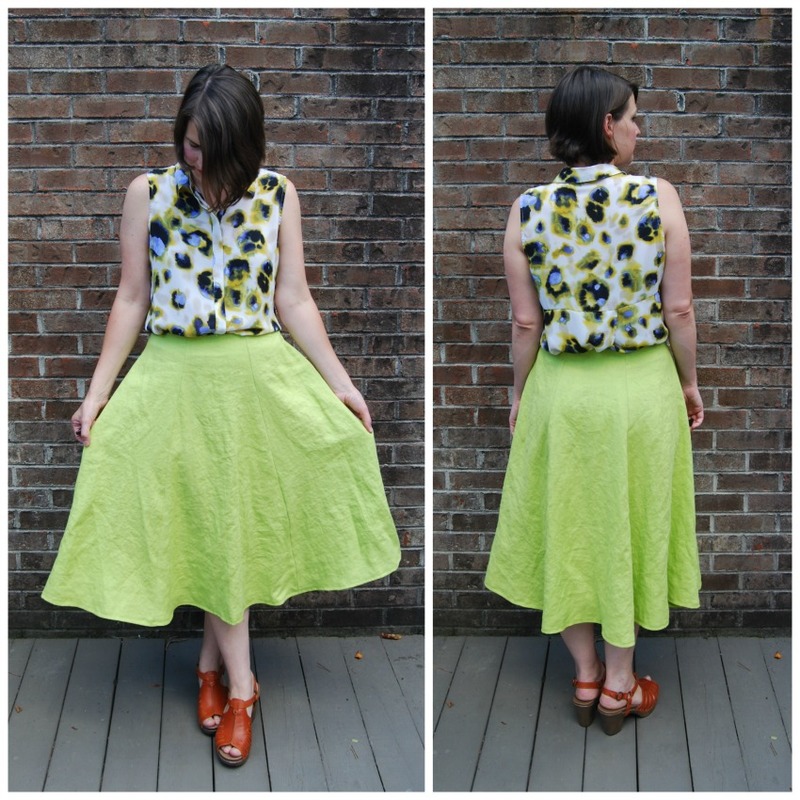 Fabric Used: The main attraction of this skirt is the linen. It's a beautiful, smooth and crisp linen from fabrics-store.com. I've been buying quite a bit of linen from there and I've always been pleased. This particular linen is listed as a 'luxury' linen due to the fact that it is has a higher thread count. And it does indeed. The weave is tighter than any linen I've sewn with before, which really does make it feel more luxurious. But it still has that wonderful airy rumple that I love so much. Oh linen, how I love you! Let me count the ways. In case you haven't noticed my love affair with linen. 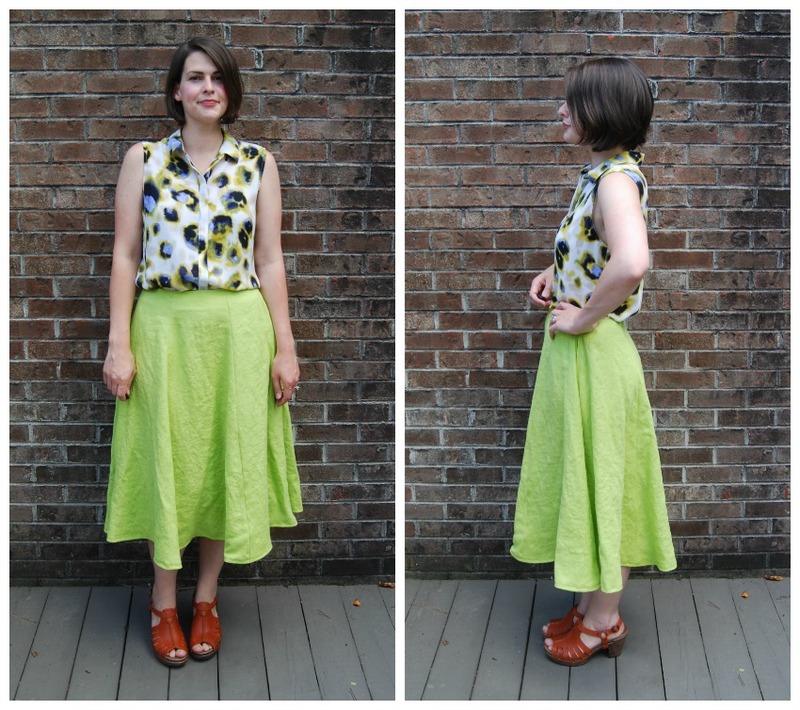 Likes/Dislikes: I wanted to branch out and try a midi length skirt. A true midi length, hitting just below my calves. I'm not sure how I feel about now. Hence why I am on the fence about this one. I actually like it in these photos but I did feel a little frumpy when I was wearing it. It is wonderfully cool to wear. And I do majorly love the color. My only other nit-picky complaint is that I can see the edge of the facing through the linen. I serged the edge and there is a visible ridge there. I kind of wish I did the waistband instead of the facing for this particular skirt. Alterations/Deviations: None, other than nipping the waist in. This is a good pattern with lots of options for a fuller skirt. Could of used in seam pockets, though. Conclusion: I'm going to try wearing it a few times before I decide to shorten it or not. I don't want this pretty linen to sit unworn in the closet.